Who can solve the deep problems in the peace process? WE’RE living in strange times. Almost 20 years after the peace process brought one of the world’s longest-running conflicts to an end, it's clear that something is seriously wrong. After a screening of the acclaimed documentary No Stone Unturned in Belfast last night, the film's producer Trevor Birney was joined on a discussion panel by Police Ombudsman Michael Maguire. Dr Maguire discussed the political deadlock over replacing the "fragmented, ad hoc, underfunded" justice system that is failing to resolve the thousands of killings linked to the violent legacy of the Troubles. "I am absolutely convinced that we need a better way of dealing with the past," he told the audience. "Will it happen? Your guess is as good as mine." The documentary by The Detail’s sister company, Fine Point Films, reveals the extent of state collusion in the infamous Loughinisland atrocity where the loyalist UVF shot dead six Catholic men watching a football match in a bar in the Co Down village. Police watchdog Dr Maguire previously confirmed that state collusion was a “significant feature” in the 1994 killings. No one has ever been convicted for the murders. Following the documentary’s release a statement from the Police Service of Northern Ireland (PSNI) condemned the killings but also questioned the film's use of information drawn from official documents, which the police said they now wish to see investigated. The PSNI reference to the documents angered the bereaved relatives, given what is now known about police handling of the case. Evidence from the Loughinisland murders was destroyed under contested circumstances, officers failed to promptly interview suspects and basic lines of inquiry were obstructed. Weapons from the attack were traced to a 1980s arms haul which could have been seized, had it not been for the fact that loyalists were tipped off. The same haul of weaponry was linked to the so-called Glenanne gang, made up of loyalists and security force members, blamed for 120 killings on both sides of the Irish border. Last week a judge in the High Court in Belfast compelled the PSNI to complete an investigation into the Glenanne gang. The Historical Enquiries Team (HET) had carried out 80% of the probe before the special unit created to investigate the past was shut down. Following the 1998 Good Friday peace agreement, police reform was one of the pillars of the new era. The PSNI was created as a result of a major overhaul of the former Royal Ulster Constabulary (RUC). Today the police continue to face the deadly threat of violence from dissident republicans opposed to the peace process, but the recent controversies highlight the degree to which the new era in policing has been held back by the past. A turning point was the British government’s decision to scrap the 50/50 recruitment of Protestants and Catholics, which was aimed to balance a police service that was more than 90% Protestant. From 2001 to 2011 the policy saw Catholic numbers jump from 8% to 31%. Now the trend is downwards, with a recent pool of recruits including only 19% from the Catholic community. Another pillar of the peace process could, in theory, have remedied the issues hampering policing. The Northern Ireland Assembly was created as a platform for the Protestant/unionist community and the Catholic/Irish nationalist community to build a shared future. Nationalists in particular came to see the assembly as a bulwark against their rights. It is clear that the DUP overplayed its hand during the last decade in government at Stormont, culminating in the decision of Sinn Féin to collapse the institutions. There were many factors at play, but a key element was that the DUP was courted by successive governments at Westminster, making it easier for the unionist party to resist uncomfortable compromises at home in Belfast. 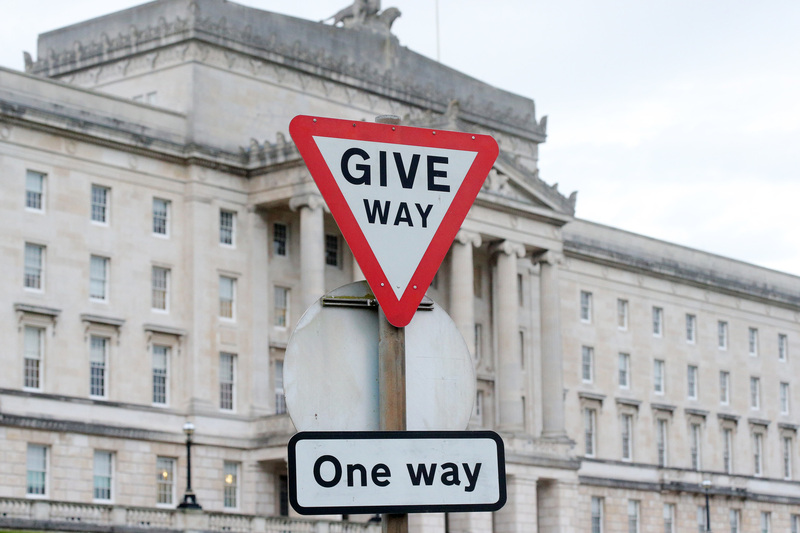 A further pillar of the peace process was the "principle of consent", which ensured that Northern Ireland would remain part of the UK until a majority decided otherwise. This was a comfort to unionists, but the trade-off was that the sovereign government in London was to ensure “parity of esteem” for both the British and the Irish traditions in Northern Ireland. Those pillars of the Good Friday agreement have now been further undermined by Brexit and the prospect of a hard border on the island of Ireland. How do we reset these big issues? If we look to government for help, we find the same Conservative Party which scrapped 50/50 police recruitment, which is accused of blocking a deal on the legacy of the Troubles, which relies on the DUP for power, and which is pursuing hard-border policies on Brexit. When a government watchdog such as Michael Maguire speaks out, who do we expect to respond?